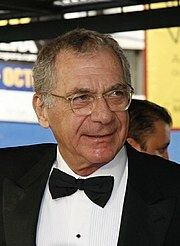 Sydney Irwin Pollack (July 1, 1934 - May 26, 2008) was an American movie and television director, producer and actor. Pollack was born in Lafayette, Indiana. During his childhood he moved to South Bend, Indiana. He moved to New York City when he was 17. He won an Emmy Award in 1966. He won two Academy Awards and a Golden Globe Award for 1985 movie Out of Africa. He died of cancer of unknown primary origin in Pacific Palisades, Los Angeles, California. This page was last changed on 30 December 2016, at 19:16.